Nokia D1C was earlier reported as one of the mid-range smartphone from the Finnish smartphone maker. Wait, a new benchmark reveals it’s a tablet and not smartphone. An Antutu listing last week confirmed a Nokia device running Android 7.0 Nougat in works. The device was easily conceived to be one of the midrange smartphone based on the specs but it seems Nokia has some other idea. 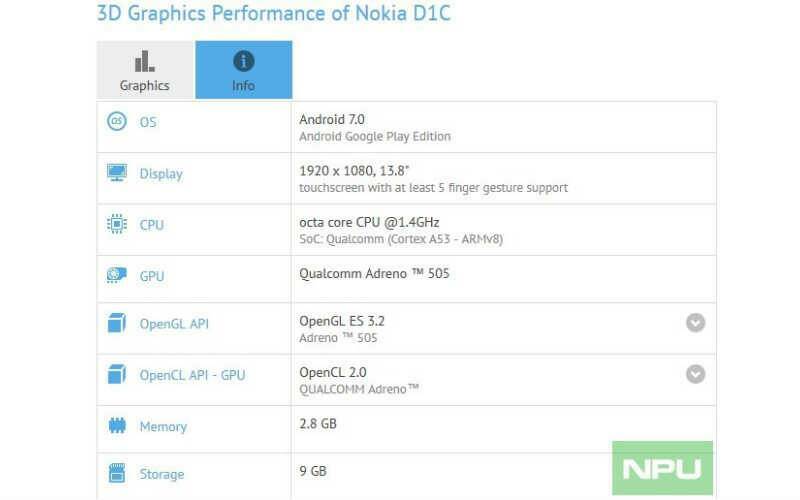 With D1C, Nokia is probably aiming at an Android-based home entertainment device. The tablet is a likely competitor to Samsung’s 18.4-inch Galaxy View tablet. Famous leakster Steve Hemmerstoffer, aka @onleaks, has posted a photo on Twitter which leaves little to imagination about the Nokia D1C tablet. Hemmerstoffer has cited Geekbench for the leaked specification sheet of the tablet. The specs sheet shows that the Nokia D1C features a 13.8-inch Full HD display with a resolution of 1920 x1080 pixels. The Nokia tablet runs on a Qualcomm octa-core processor running at 1.4GHz speed. The processor is backed by Qualcomm's Adreno 505 GPU. Looking at the technical specifications of the CPU, it's very likely to be the Snapdragon 430. The Nokia D1C comes with 3GB of RAM and 16GB internal storage. The leaked image marks internal storage at 9GB, which we believe is the space sans Android and other system files. The tablet will come with Android 7.0 Nougat operating system. On the back, the Nokia D1C comes with a 16-megapixel camera with autofocus and flash. The tablet also carries an 8-megapixel camera on the front. It's yet not clear if the front camera also has flash and autofocus features. Both the cameras are capable of recording videos at 1080P resolution. Nokia D1C is also reported to run Z Launcher based Android 7.0 Nougat. With Nougat, the D1C will have added benefit of split view multitasking and improved doze mode. Nokia D1C will also feature SIM card support along with support for sensor like pedometer. Back in May this year, Nokia had announced that a Finnish company HMD had "conditionally agreed to acquire from Microsoft the rights to use the Nokia brand on feature phones, and certain related design rights". If Wang's statement is to be considered an official remark, we can expect two more Nokia phones along with D1C tablet. So what you guys think about the upcoming devices of Nokia. Will Nokia be able to gain its position back in smartphone market? Do share your views and opinion in comment section below.